The new docking framework introduces service-based semantic, which allows for granular and pluggable functionality per RadDock instance. The entire drag-and-drop functionality is handled by the registered DragDropService instance, which simply receives drag requests and instantiates the appropriate operation. The service is responsible for drop target hit-testing, displaying docking guides and docking hints as well as for processing user input while dragging is in progress. The Boolean parameter determines whether the operation should be committed (applied) or not. The service can operate in two modes: Immediate and Preview. The Immediate mode is the default one and it means that when a drag-and-drop operation is instantiated, the dragged window will be immediately detached from its current DockTabStrip and will become floating. 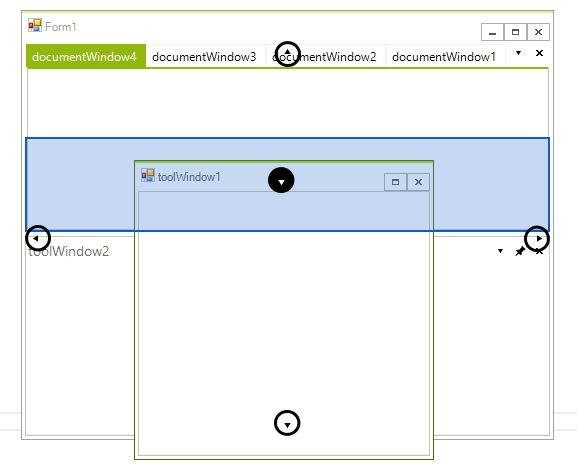 On the contrary, in Preview mode the DockWindow will not be detached but rather a semi-translucent rectangle will be displayed, indicating the floating position it would take if the operation is committed. The major benefit of this new mode is that the operation is completely cancelable. 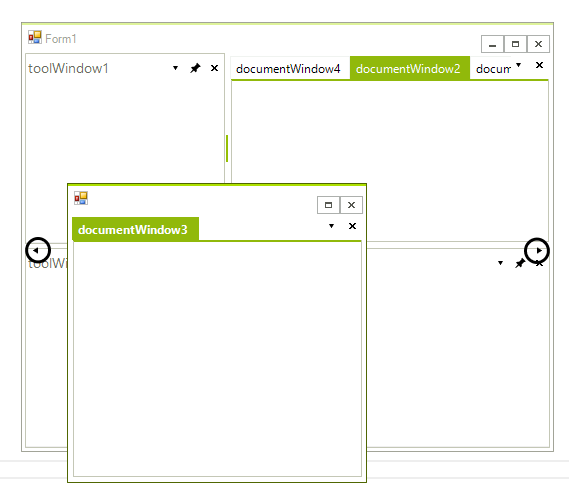 The Preview mode is currently used by the framework at design-time. Starting: Notifies that the service is about to start. The drag context is passed as an event argument, which allows listeners to examine it and optionally cancel undesired operation. Started: Notifies for a successfully started DDO. Stopping: Notifies that the service is about to stop. The Commit parameter is passed as an event argument, which allows listeners to examine it and to modify it or to prevent the service from stopping. Stopped: Notifies that the service is successfully stopped. Dragging: Notifies for a drag pass, performed upon each mouse move. Allows listeners to stop the DDO under some circumstances. PreviewDropTarget: Allows listeners to examine and/or optionally modify the currently hit-tested drop target. For example, this may be used to exclude certain panels from being hit-tested. PreviewDockPosition: Allows listeners to examine and optionally modify the allowed dock position for the current drag operation. For example, here is the right place to allow dock only bottom for a specific drop target. PreviewHitTest: Allows for preview and/or modification of the generated hit-test result. Figure 1: Only DockPosition.Bottom is allowed. Figure 2: Only DockPosition.Left and DockPosition.Right are available.